I'm going to do what every big sister does: blame my little sister. It's her fault. It IS. Seriously. About a decade ago, my little sis was a freshman at the university where I happened to be working. That situation lasted one all-too-brief, awesome semester before she and I both moved on to different places. More on that in a minute. That school year my sis was using a Quo Vadis Textagenda day per page academic planner. I was obsessed with it. 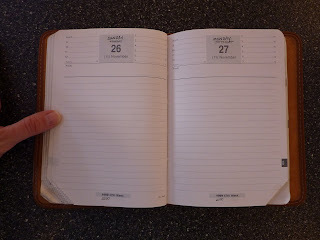 I had never used a day-per-page planner before and was fascinated by how she used it. 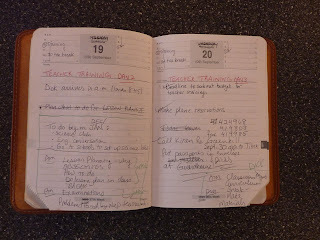 Whenever she had to write down directions to someplace, she wrote them directly onto the page of the date she was going there, because there was plenty of room on each day's page for notes. Whenever she had to jot down a telephone number, some random note, an assignment, whatever--onto today's page it went. No lost sticky notes or scraps of paper. I was enthralled. The book itself was marvelous: a hard, shiny, colorful cover (that they don't make anymore). That famous Quo Vadis paper. The anno-planning calendar. It was the perfect size to hold in my hand or tuck into a bag. I wanted one. Fast forward a year, when I had moved on to my next destination: Nepal, where I was a Peace Corps volunteer. During my 2 years there I felt deprived of American products constantly, especially notebooks and planners. I begged my mom and then-19-year-old sister to send me a Textagenda just like my sis had the year before. They searched and scoured every store they could find. I think. Or maybe they just goofed off and promised me they were looking, who knows. Meanwhile I was on the other side of the world salivating at the very thought of a cheeseburger. And a Textagenda! Finally they found one, on sale no less, and sent it to me. But by the time they found it, and the 6 weeks it took my mail to reach me had passed, the planner was only a month away from finishing. Oh, the heartbreak!! The devastation!! Just when I had finally gotten the thing I craved so desperately, it was almost done. So, I did what all Peace Corps volunteers are best at: improvising. As you can see by the photos (which you can click on to get a bigger view), I went through every single page of that planner and changed the days to reflect the upcoming year's dates. Obsessive? Yes. But I had plenty of time on my hands and I really wanted to use that planner!! Now when I look back through that Textagenda I vividly remember my days as a volunteer: Planning teacher trainings. Traveling to see other volunteers. Buying my vegetables at the bazaar. At the time it seemed very mundane, but reading it now takes me back to that unique time of my life. And my mom and sister got an earful (actually an eyeful, from my written letters) about sending me a nearly-expired planner. For the following year they sent me a day per page Exacompta Daily Pocket planner, this time in plenty of time before the planner started! Thanks for sharing this story. It really brings to life the importance of documenting our lives. What seems mundane today will help to remind us and be able to share with others, moments of our lives that would otherwise be forgotten.